AdvertisementAdvertisement Japanese whalers have admitted almost all of the mature female minke whales they killed in Antarctic waters last season were pregnant. But that's good news, they insist, supporting their argument that the population is strong enough to allow a return to commercial whaling. Japan's whaling research body, the Institute of Cetacean Research, today said 91.6 per cent - or 262 of the 286 mature female minkes taken during the last hunt - were pregnant. "Almost all of the whales are becoming pregnant each year. This is good news. This is great. It shows that the Antarctic minke population is increasing rapidly," the ICR's Glenn Inwood said today. "The consistent population must provide strong reassurance that the population will easily sustain a commercial quota." Inwood took issue with the way The Humane Society International (HSI) presented the issue yesterday. He said there had been no mention by the group that almost all mature female minkes were pregnant at the time the annual hunt goes ahead, typically from December until March. In a statement yesterday, HSI said more than half of the minke whales captured by Japan in Antarctic waters last season, were pregnant. "It horrifies Australians to know that pregnant humpback whales breeding in the warm waters off Australia this winter will be targeted by the Japanese hunters in Antarctic waters this Christmas," HSI's Nicola Beynon said. 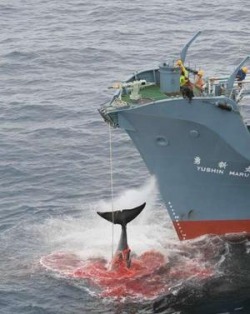 HSI was using figures from a review of Japanese reports from the most recent hunt, ahead of the resumption of a Federal Court case the group is taking against Japanese whaling company Kyodo Senpaku Kaisha Ltd. While HSI's assessment was not wrong, Inwood said it failed to provide an accurate context. The group was being unnecessarily emotive, he said. "Those figures from the Humane Society are extremely manipulative. They basically demonstrate the organisation's ignorance and lack of understanding," he said. "It is an extremely cynical move and I think what they are doing is using an ignorant media ... to manipulate the public of Australia and New Zealand." Inwood said that of the 503 minkes taken last season, 104 were male and 349 were female. Of the females, 63 were immature, 262 were mature and pregnant, and 24 were mature and not pregnant. Japan carries out an annual whale hunt in Antarctica as part of its research program, aimed at providing data to resume commercial whaling. Whales hunted under the program ultimately end up on dinner tables, where whale meat is a traditional dish, leading to claims of whaling by stealth.